The U.S. Department of Energy (DoE) has proposed mandatory efficiency standards for a wide range of consumer and industrial “appliances”. The proposed standards will require a very substantial increase in efficiency relative to the average distribution transformer produced today. To support development of efficiency standards that would be "… technologically feasible and economically justified and would result in significant energy savings …," DoE commissioned a very elaborate and complex analysis. This white paper reviews DoE’s analysis process, and the resulting efficiency standards. The standards are compared to conventional utility total owning cost evaluation (TOC) methodology. The DoE has proposed minimum distribution transformer efficiency standards based on a very complex and detailed analysis. This analysis, however, has a number of shortcomings. The most notable of these is failure to consider the recent large increases in transformer prices, driven by material costs. Furthermore, there is no consideration of the fact that adoption of the efficiency standards will further increase material demand, which will inherently increase prices further. Another major flaw in the DoE analysis is failure to consider the rather significant tax implications to utility capital investments. In fact, DoE’s engineering analysis shows transformer weight decreasing with increased efficiency; a finding completely opposite of practical experience. 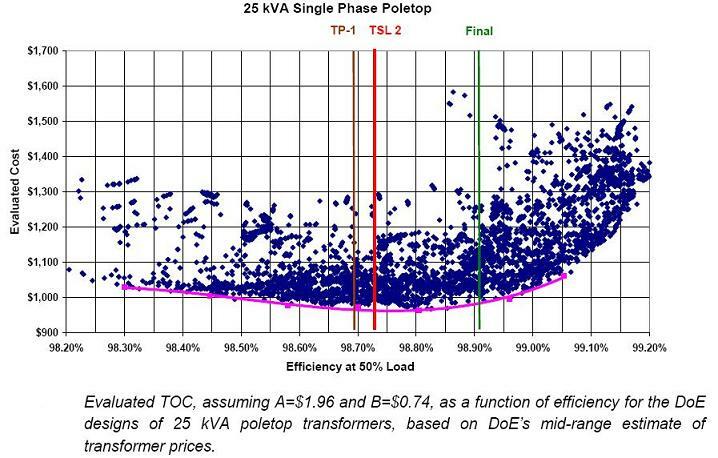 Total owning cost analysis, as standardized by the utility industry, is a more meaningful approach to evaluate the economics of a transformer procurement than the life-cycle cost analysis performed by DoE. The analysis details are described in a 32-page final report. The table of contents is shown below.